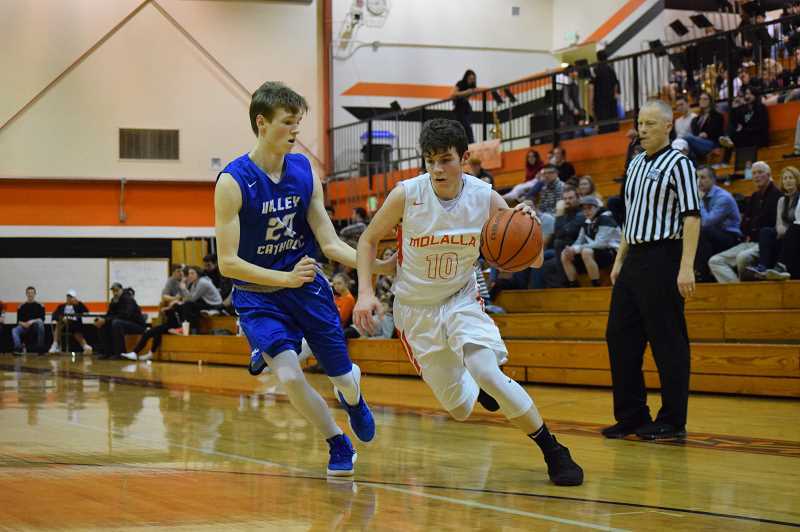 Though Molalla was coming in off of the first win of the season against Scappoose, the team failed to capitalize on that momentum against the surging Valley Catholic boys' squad. After hanging tough in the first half, Molalla was throttled 58-23 on Wednesday, Jan. 9. "We played pretty well in that first half after the first couple of minutes," Molalla assistant coach Josh Trott said. "It took us a bit to get our offense going. We held them to 21 points. They sit back in that zone, so I thought we were very patient. What killed us was turnovers and letting them have second chance points off of the rebounds." The first quarter started out with the home team slowing things down against the Valiants. Molalla moved the ball around the outside looking for openings in the staunch Valley Catholic defense, but was unable to get something going in the key. The only offense Molalla mounted was a pair of 3's courtesy of juniors Derek Pederson and Jakob Noe. On the flip side, Valley Catholic was able to drive its way inside, finding layups and working its way to the foul line. The away team went 4-of-6 from the charity stripe, and ultimately ended the quarter up 10-6. In the second quarter Valley Catholic went on a streak, continuing to punch the ball inside and find layups. Senior Jack Tetzloff had six points in the quarter, and led the way for Valley Catholic in the first quarter. Molalla was able to regain some ground by the end of the first half, with Pederson sinking another 3-pointer and a pair of free throws, and senior Brice Sperl chipping in a basket from inside. By the half Molalla trailed by just eight points, following 21-13. "I think looking at that first half and seeing that we can play with a team like that," Trott said. "Even though they're probably bigger and more talented than us, we can still play with a team like that. We've been able to do that in spurts this year, it's just being able to put it together for a whole 32 minutes." The third quarter was where Valley Catholic pulled away and put the nails in the coffin. Against Molalla's two baskets in the quarter, the Valiants put 12 through the net, including nine straight in the middle at one point. 6 foot 4 inch senior Peter Boileau led the way with 12 points in the quarter, and had 16 points in the game overall. After the third quarter, Molalla trailed 51-18. The fourth quarter was a little muter for both teams, and Valley Catholic picked up another win 58-23. Molalla's Pederson had 16 of the team's points in the contest, primarily doing damage from beyond the arc. Molalla falls to 1-10 on the year in its second loss to Valley Catholic, and lost to Astoria (5-9) 49-25 on Saturday, Jan. 12.